It's been a busy week at Dignity Village and as usual a whole heap a tings a gwan. 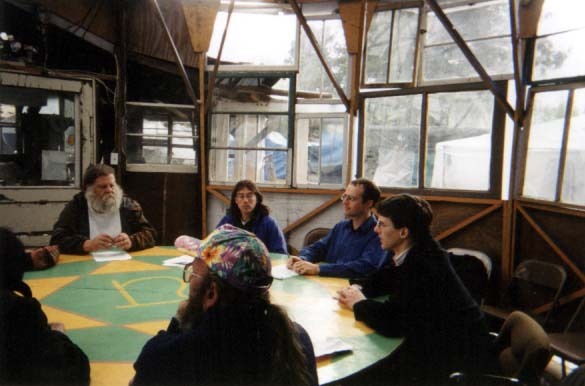 Our first Site Development meeting was held in the village's geodesic council chamber under what many villagers refer to as the Eye of God, the chamber's translucent roof, instead of in the usual staid surroundings of Commissioner Sten's office at City Hall or at Minister Kate Lore's First Unitarian Church. Up for discussion was Dignity Village's next site or possible sites if permasite is not found by our next move from Sunderland Yard on July 1st when our rent runs out at our present City-owned location, also ways of making a smooth transition to our next location at that time. Dignity Village has been a hive of productive activity for several months now as formerly houseless villagers construct their own housing, common areas and showers accessible to all members of the community. Our houses have colourful names like Hoover Villa, the Dog House, Freedom Train, Magic's Kingdom and the Chili Pad and are built for the most part from recycled lumber, windows and doors from the Rebuilding Center. One aspect of site development's transitional side is the smooth deconstruction and relocation of the structures and facilities we have built to our next site. Magic's Kingdom Young Gareth Linvall and her students from Environmental Middle School came out to the village on Friday to complete the planting of the veggie boxes, raised vegetable beds jointly built by students and villagers. Much of the seeds and starters planted will ripen by our July 1st moving date and it is the intention of the village to share the fully organic harvest with the students of EMS. Much respect to Gareth and villager Tim M of Dignity Village's outreach team for their excellent coordination of this project. 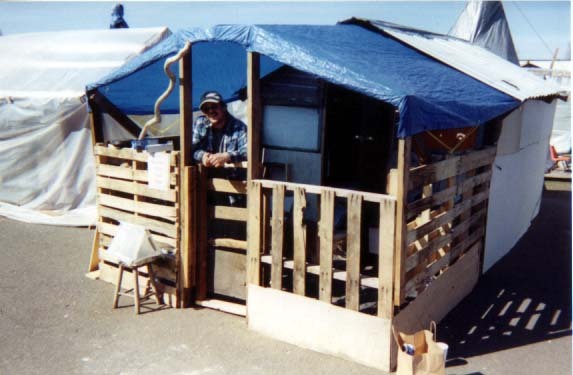 Watch for our booth at the Earth Day 2002 Celebration at Environmental Middle School on April 20th where City Repair Project, home of visionary architect Mark Lakeman, will also have a booth. Also on Friday council officers Watchdawg and JP Cupp, just in from setting up structures and plowing the fields at this year's Digsville Farm, brought a load of organic fertilizer and strawberry seedlings for the village's greenhouses and planters. The farm this year is located on private property near Hagg Lake, OR, about sixty miles southeast of Dignity Village's present location. Watchdawg, Soldier Emilee, JP Cupp and his dog Ernesto are all missed at the village but it is expected that there will be much traffic and trade between the village and farm as many villagers travel back and forth to farm, fish and swim. Officer JP, who coordinates this year's effort, says that the farm is "doing very well." Finally much planning is going into the up-coming tentcity summit in Santa Cruz, CA, home of Dignity's sister tentcity Camp Paradise, which is slated for May 3rd and 4th. Dignity plans to send up to twenty delegates to the summit and looks forward to meeting and working with its brothers and sisters who live in Paradise, Isla Vista's Camp Home Sweet Homeless, Seattle's Tent City, and other encampments from up and down the West Coast and beyond. 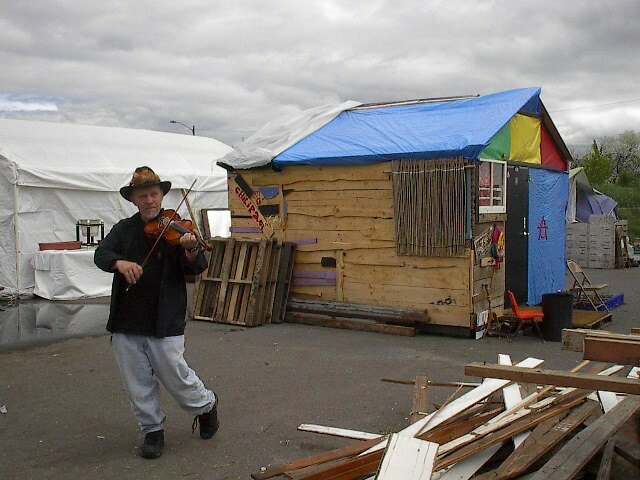 Dignity Village guest and member of Santa Cruz-based Homeless United for Freedom and Friendship Fiddler Jeff is helping with liaison and coordination for the summit.